2. 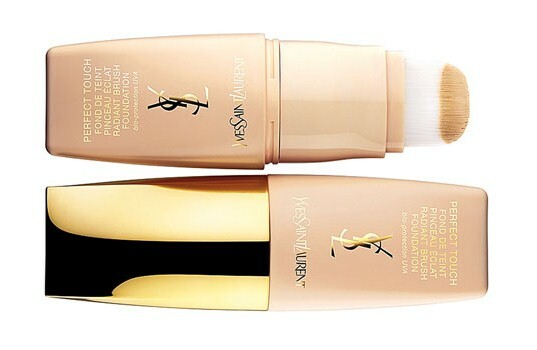 Yves Saint Laurent - Perfect Touch Radiant Brush Foundation (I got tester from ebay.com). It looks like this in a full size. It promises to restore skin's optimal hydration level and ensure a flawless result. The product should be for all skin types. Well…I think the finish is too powdery, which makes the face look fake and flat. It emphasizes dry patches on the skin, thus it is not suitable for dry skin. Also the shade #1 (which I have) which should be neutral (nor pink nor yellow) has a good hint of orange in it. But I like YSL`ish scent of the foundation. The coverage is medium, but it is buildable. As a conclusion I think this may be a good foundation for oily skin. 3. Biotherm – Biopur pore reducer (gentle purifying lotion). This is my favorite lotion for summer months. It has a very delicate and nice scent to it. It really helps to deal with enlarged pores and prevents the formation of blackheads. It also refines the skin texture very good. 5. Lancome – color ideal poudre (I wrote about this in a post – cosmetic loss) I think this is a good powder, but nothing special about it. 8. Lierac – initiac 1st wrinkle cream (sample). Maybe it is too early for me use creams like this (I am 26), but it think it is too heavy. The scent is nice, but I prefer my current eye cream - Avene - Soothing Eye Contour Cream. This is it! Hope you find this information useful.